Evolution has beeen highly recommended by Nature because it's easy to learn, quick to play, and captures key aspects of the evolutionary process. 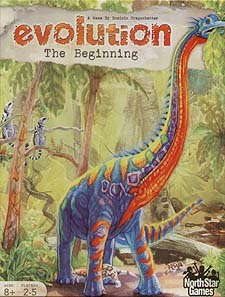 Evolution: The Beginning is a stand-alone game and is not compatible with other games in the Evolution product line. For 3-5 player, it's a casual strategy game to play with family and friends. For 2 players, it's a highly strategic battle of wits. So gather around the table and see who best adapts to the changing world around them!